For over fifteen years, I worked in high schools as a college counselor. I read applications at UC Berkeley for about ten years.In that time, I’ve worked with scores of kids and have read thousands of essays. While there are no set formulas for getting into the most selective colleges, here are some ways students can prepare themselves for that path. This is from an article I wrote for a local publication while I was still doing college counseling. The fundamental things still apply. . . 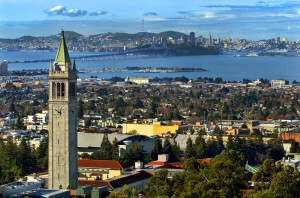 The University of California, Berkeley. Photo courtesy of Berkeleyside. To paraphrase Freud, “What does a college want?” And to fine-tune the question even more: What do the highly selective colleges want? How can your student improve the odds? If the definition of a student is “a person in zealous and voluntary pursuit of knowledge,” then it would follow that highly selective colleges are looking for exactly this type of person. If a student likes to wrestle ideas to the ground and hang around after class to finish a discussion, then you have an authentic learner: someone who wants to learn and is genuinely engaged in ideas that further learning. It’s no golden ticket in these highly competitive times, but it does get the attention of an admissions officer. If a student’s goal is to make it into the most selective schools, it pays to start early by choosing classes that are challenging and interesting. Can’t find what you want at your school? See what your local community college has to offer. Another language? Higher level math? Advanced science? Chase after the education you want. This shows initiative and indicates that you know how to make things happen. What college wouldn’t want a student like that? It goes back to that zealous and voluntary pursuit of knowledge. Some givens: Take challenging courses in all four years of high school and work hard. While it’s easy to want the results without putting in the time, you can’t beat preparation, good study habits and a solid work ethic to produce an impressive transcript. Make sure that your extracurricular activities are leading somewhere— increased amounts of leadership, dedication to a cause—something meaningful that you can tie together with your other interests. How far can you take an interest? Consider summer courses on a college campus or volunteering your skills or talents during the summer so that others may learn from you—whether it’s playing the piano, being a camp counselor, coaching, or mentoring younger kids in academics. Parents, let’s say your kids are years away from college. Now is the time to expose them to the zoo, the aquarium, age-appropriate theater and musical events and museums; sports, the library, and day camps with arts and crafts and outdoor activities. You never know what will grab a kid’s attention and become a life-long interest, if not a passion, in later years. Time and again, kids who are really interested in something in high school can trace that interest back to a childhood experience, whether it’s a love of animals, storytelling, baseball, or building with Legos. Do it now! Learning who you are and taking the time to figure out what college means is something that most kids save until fall of senior year. It’s almost too late by then! The personal statements that most colleges ask for are a critical part of an application and can make an admissions committee sit up and take notice. Do you have a unique perspective on life? Can you express this in writing? The notion that you have to write about overcoming a major obstacle in life is not true! Nor is it a good strategy to exaggerate a life experience for dramatic effect. A student needs to take the essay prompts seriously and give a great deal of thought to how the questions are going to be addressed. What colleges want is for the genuine voice of a 17 year old to shine through in the writing. In many cases, a thoughtful and reflective essay can make a huge impression on the college admission officer who reads it. Can it make up for a less than perfect academic record? In some cases, it can. Does the student show great potential and self-awareness? The reaction you want to elicit from the reader is “We have to have that kid on our campus!” Summer is the ideal time to work on college application essays. Another given: Most colleges require standardized tests. You need to take them, you need to do your best, and you need to make sure that you are prepared ahead of time. How you do that depends on how you learn best: self-guided study, group sessions, or one-on-one tutoring. However, life is more than grades and test scores. It’s important to “get a life”! Students should not miss out on opportunities that enrich their knowledge and life experience outside the classroom. Read books, all kinds of books. Not only will students expand their literary horizons, but they will become better writers. Students should get to know their teachers (especially in junior year) well, and establish a relationship with their counselor. These are the folks who will be writing letters of recommendation—and it’s best if those letters are comprehensive, compelling and complimentary. As we will see again this year, the most selective colleges cannot admit hundreds (or thousands) of highly qualified applicants. However, the good news is that any student who achieves through hard work, and makes thoughtful choices, will be accepted into a great college. So, prepare the child for the path, and watch them succeed. ← And in the end. . .